This weekend I stayed at Innisbrook Golf Resort, a Salamander Golf & Spa Resort with my husband Gabe and his parents. There is one thing need to say before this post starts. From 2003-2009, I worked for The Ginn Company, who developed and managed Hammock Beach and Reunion. Salamander now owns these properties. I went into this weekend knowing Innisbrook was now the sister property of two resorts I hold dear to my heart. Being I spent the majority of those 7 years staying at golf resorts around the US, my expectations were high - probably higher than most guests. I can happily say I was not let down in anyway and my expectations were exceeded. We had a lot planned for our weekend away - Gabe and I played the Island Course on Saturday. On Sunday, I took Gabe's Mom to Spa Indaba while Gabe and his Dad played the North Course. I will do a separate posts on these experiences but we were blown away by both. We had dinner at Packard's Steakhouse, which you can read about by clicking here. We also had lunch at Turnberry Pub which I will write a separate post on. I was looking forward to spending time at the Loch Ness Pool but the rain had other plans for us. Upon driving into the resort, I first noticed the buildings were a little older but don't let the exterior fool you. We had two different styles of rooms with attached doors - a one bedroom suite (980 sf) and a Deluxe Room (225 sf). Our unit was updated with every amenity you could wish for - 3 flat panel TV's, iPod docking stations, a full kitchen, built in bar, living room, dining area, two bedrooms and two bathrooms. The bedrooms were very spacious with walk-in closets. The master bedroom had a sliding door which lead out to the spacious private patio. The bed's were beyond comfortable with deluxe linens. It made waking up early to play golf a very hard task. If the weather was nicer during our trip, I am certain we would have enjoyed wine, craft beer and margaritas on that patio. Gabe's parents took the deluxe guest room which was a nice sized area. Overall the accommodations were very comfortable and spacious. The bathrooms were a nice size - both with marble counters. 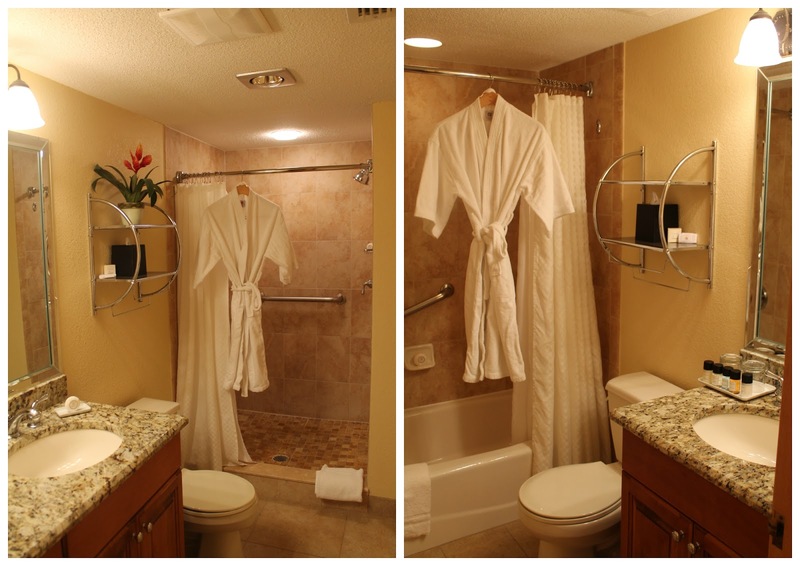 The One Bedroom Suite had a large walk in shower while the Deluxe Guest Room had a tub. Although we didn't get to spend time at the pool, I did snap a few photos when the sun was trying to come out. There are so many activities for families at Innisbrook - especially at the Loch Ness Monster Pool. The pool is huge with two winding slides, a 15 foot waterfall, separate plunge pool, and a monster sized spa that seats up to 36 people! We will be back when the sun is out to experience this pool for ourselves.